Twin City Sound school events and proms are high energy beat mixing shows. We carry the newest, most popular clean edited dance music and videos in Pop, Rock, Hip-Hop, Electronic, Dub-Step and Country! Kids and teachers love our company because our seasoned DJ's mix clean high energy music using 10 foot high stacks of bass pounding speakers. When this awesome sound is used in combination with the newest, state-of-the art intense laser and strobe lighting, the energy on the dancefloor is electric! If your school dance attendance is over 600, we suggest you try our "Super System". Four 2000 watt amps powering 6 pounding sub-woofers, 8 mid/high speakers and 6 tweeters. "Making your dance feel like it has concert type of sound!" Karaoke is available for only an extra $100. 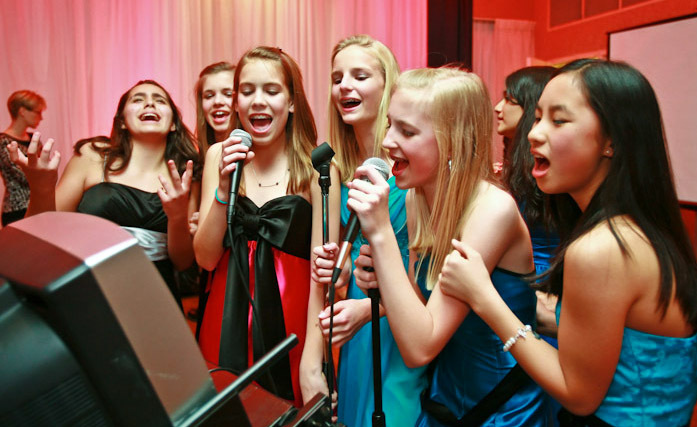 However, if your school would like a separate Karaoke only set-up, for example, Karaoke in the lunch-room and the dance in the gym, the price is an additional $200 added to the original school dance price. The extra $200 covers the rental of a smaller DJ system and the cost of another Twin City Sound DJ/MC that controls the Karaoke area, making sure the kids are behaving and singing songs that are appropriate. Twin City Sound provides great entertainment for kids of all ages. Our interaction with kids is second to none. Our elementary school dances called "activity dances", where we host group dances and games with the kids. The games include: Hula-Hoop, Limbo, Red-light/Green-light, Potato Sack race, Musical Chairs, Over-n-Under, plus themed games like Mummy-Wrap and Plastic Egg-toss are great activities to help kids stay busy and having fun! TCS DJ's are well versed in hosting dance contests like: Swing, Freestyle and Break-Dance. These contests let the kids express themselves and have fun. Ultimately, we tailor the show to your specific school and age of the kids. Input and other ideas from the school coordinators is always greatly appreciated. TCS will always bring the requested props like; Hula-Hoops, Limbo-bar, Potato-sacks, etc. We ask that the school provide a gym mat for the limbo contest and all prizes.